Faith will graduate Uhuru Academy in 2018. She lives with her mom, two siblings, and one cousin at Githurai near Nairobi. Faith aspires to be a lawyer in order to defend the rights of the less privileged. She believes everyone should be equal in the eyes of the law and justice should be done to all. 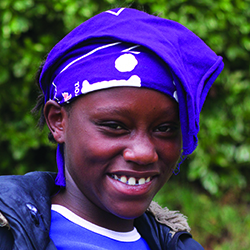 Faith has been thriving at Uhuru Academy and is performing at the top of her class. She attributes her academic accomplishments to the positive environment at Uhuru. She claims that the environment is conducive for learning, with teachers and students who treat one another well. Faith is known at Uhuru Academy for constantly having a positive attitude. She is intelligent, creative, well-spoken, and confident. Click here to sponsor a student like Faith.